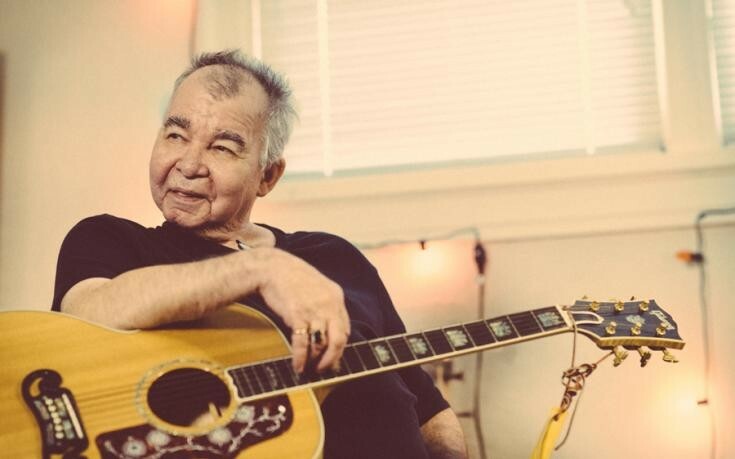 I have to admit: I have not been a longtime John Prine fan. That would be my husband, Joe, who first saw the folk singer-songwriter at the now-demolished War Memorial Auditorium in Greensboro, with Arlo Guthrie, 20 years ago. But I have joined the tribe of followers who love the “singing mailman” from Chicago, Illinois. For our anniversary last year, I took Joe to the Durham Performing Arts Center to see Prine and became a convert myself. The trek to Charlotte on a warm, balmy, September night to see the singer this year was an early birthday present for Joe. It began with dinner from the Halal Truck at Trade Street, where we were loudly serenaded by a street preacher from across the street; he advised us and everyone within hearing distance on the price of sin and let us know Jesus was coming to save our souls. It was quite the opening act for Mr. Prine. But the real opening act was Dan Auerbach of the Black Keys. He was enjoyable, and played great guitar, but the 10 or so guitar changes were a wee bit distracting for me. Prine, on the other hand, was stellar. The entire show was a singalong, a beautiful hum of voices joined together and singing along word-for-word, especially during “Happy Enchilada,” the misheard words to "That's the Way the World Goes Round," whose real lyrics are, "It's a half an inch of water." Dan Auerbach was best at the end of the show when he came out and did a couple songs with Prince, who told him, "You play the parts I don’t play,” with a big grin. Prine said he used to tell that to his good friend, the late Steve Goodman, writer of the classic "City of New Orleans," when they played together. From the wings, you could see the beautiful, statuesque figure of Prine's wife Fiona, waiting for the singer to do a little two step-shuffle off stage and bring her into the spotlight to sing along on the encore, “Paradise,” his environmental song about the notorious Peabody coal and energy company. It was magnificent, a fitting end to an vibrant show. In the two years since we last saw Prine, we all have aged, but he still filled the Charlotte stage with electricity and love. My husband mentioned how early in Prine’s career, he would pull up a stool, play and leave. Now, Prine is a part of a big family, pulling all of us in close in a way that makes everyone feel part of a big singalong. One that we joyfully join in on, because we all know the words and are happy to sing. Prine turns 71 on October 10. Here’s to wishing him many more to come.